It was an incredibly busy week for corporate drumming events last week! First there were two big Boomwhacker Conference Ice Breaker events - one at the beginning of the week for 150 delegates at the Forest of Arden in the Midlands, the other on Thursday for Skanska at the Hilton Heathrow. 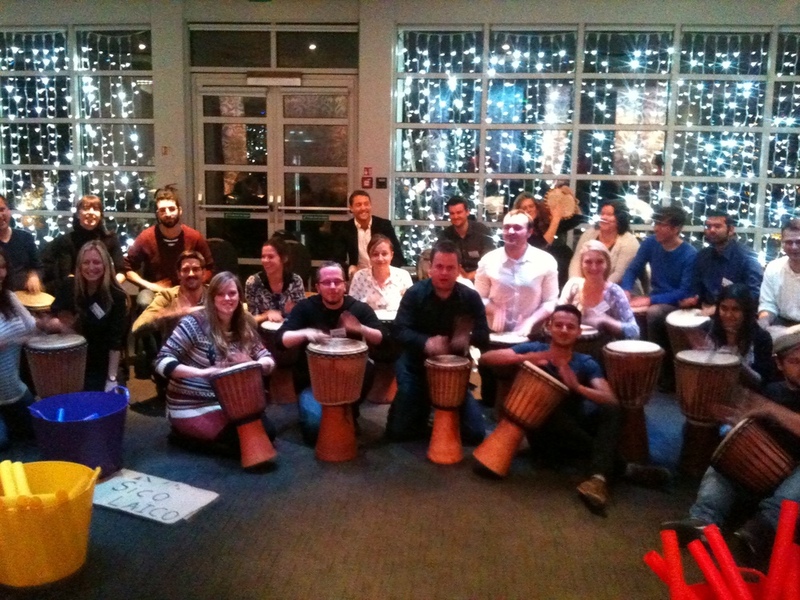 The final event on Friday was a Drum Circle team building event for the Walt Disney Company UK and Ireland. Walt Disney had picked an extraordinary venue for their drumming session. We remember they were extremely excited about their choice of venues when they first contacted us. When we arrived on the day we understood what all the fuss was about. The photo you can see above may look like a lovely garden in the country, but it was in fact a roof top garden right in the middle of London - six storeys below was the normal everyday noise, hustle and bustle of the city! ''My god!'' you exclaim - ''that's a fully grown tree!'' That wasn't all - just around the corner you could find a flock of flamingos gracefully dipping their heads in and out of a pond. Then round the other corner and up the alleyway was what looked like an Italian Village with a fountain and sunken garden. It was a shame that it was in late November as it would have been lovely to drum outside - perhaps as a drumming spin on the Beatles famous roof performance! It was however way too cold for that and the drumming session took place in one of the luxury rooms overlooking the garden. The drumming 'point and sweep' game - brilliant group dynamics, leadership, and eccentric musical conducting by certain characters in the team! The Boomwhacker session - the sound of all the colours coming together sounded beautiful! Unbeatable Energy would like to thank the Walt Disney team for their participation and sense of group spirit. Also special thanks to the staff at The Roof Garden for their help with the event logistics!